This Kasuy Hito Crusted is all about that crunch and punch of flavor. What more if you marinate it with Knorr Liquid Seasoning? It’s a winner! 1 First, let’s marinate the hito with Knorr Liquid Seasoning and set this aside for 15 minutes. 2 Second, in a food processor, grind kasuy nuts, cornstarch, salt and pepper. Transfer to a big bowl and dredge the catfish in kasuy mixture, coating it completely. 3 Now, get a non-stick pan and make it nice and hot over medium heat. Pour some canola oil and fry the fish until golden brown. This will take about 4 to 5 minutes per side. 4 Transfer to plate and garnish with calamansi on the side and that’s our dish! 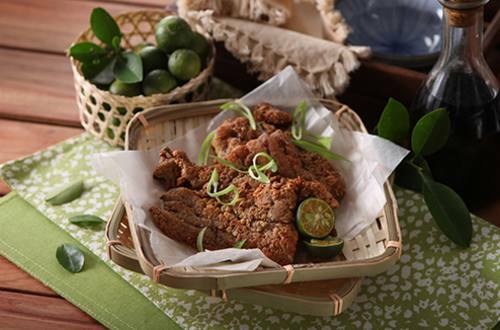 See how your family will react when they try Kasuy Crusted Hito! They will be blown away by the deliciousness of this dish.